/ES (S&P 500 E-mini futures contract) has bounced back to the resistance zone that capped the previous advance & once again, has done so with negative divergences in place. This offers an objective, yet somewhat aggressive short entry here with the next, higher probability sell signal to come on a break below the uptrend line (both trendlines on ES & NQ). 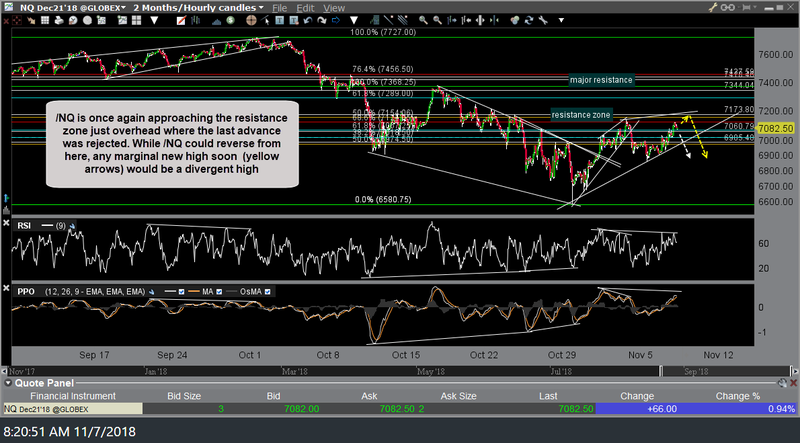 /NQ (Nasdaq 100 futures) is once again approaching the resistance zone just overhead where the last advance was rejected. While /NQ could reverse from here, any marginal new high soon (yellow arrows) would be a divergent high. Also, keep in mind that an impulsive & solid or sustained breakout above the recent highs in the $NDX & $SPX will mean that these major large-cap indexes have taken out those key 200-day EMAs as discussed in last night’s video. A solid daily close above the moving averages on both SPY & QQQ would be bullish although by no-means an “all-clear” signal for going long as there are still some significant price & trendline resistance levels overhead for the major stock indexes to contend with. 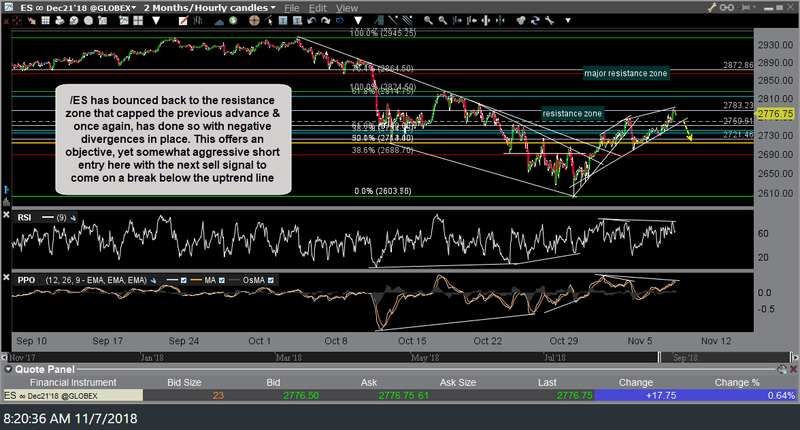 I am passing along these levels & objective shorting levels for those interested. However, the markets have been in trading in a relatively wide sideways trading range for the past week & may or may not continue to do so going forward. If so, swing trading will remain difficult as the major indices & most stocks gyrate back & forth within the recent ranges. Gm Randy and all,, been a while since I was here.. Great charts and analysis as always. Typo… meant bearish. Bullish above the 200day, bearish below although intraday moves above & below that level, especially during periods of big price swings like we’ve had for the last month are fairly common. As such, best to wait for a weekly close above or below the 200-day (40-week) EMA on both SPY & QQQ before reading too much into that level. I think that you underestimated the bullish snap back off the lows which in hindsight was a great time to go long. Still a lot of bullish sentiment that can keep the market neutral to up for a while. However, I stated back then & will re-iterate that my plan was not to try & milk every penny of the counter-trend bounce, rather some of the early move & then look to start re-positioning short when the time seemed right. I can certainly see the possibility of more upside but at this time, I think that the R/R for scaling back into swing shorts with relatively tight stops, in case this rally has a lot more room to run, is quite favorable. R/R & probability of a trade playing out aren’t necessarily the same. Either way, I was recent bullish & net long & as of today, have increased short exposure to a net short position (swing position) which I will either add to or stop out of quite likely by the end of this week. I agree.. I think Randy is a little too bearish for his own good :/ We are clearly in the advancing phase of a NEW intermediate cycle and one should look to buy any and every pull-back. I’ve stated this before in the TRADING ROOM, but people are stubborn and hell bent on hanging to their bearish bias. Thx for the high-marks & congrats on sticking with your analysis. Good call so far & we’ll see if the market can power through the remaining overhead resistance levels, particularly 178 in QQQ & SPY is already starting to poke above the big 279.50ish R level. How we close the week on Friday could be quite telling of which direction the next 10%+ in the market will be.